I am well aware that many people seem to have very specific ideas of what their cranberry sauce/relish/compote needs to be in order to fullfill it’s proper role at the Thanksgiving table. Be it fresh, cooked or can-shaped, I can’t imagine Thanksgiving without the presence of cranberry. Growing up, I always remember having the obligatory, jiggly can-shaped phenomenon sitting on the Thanksgiving table. And to be honest I loved the stuff. Carve me a slice of cranberry, please! 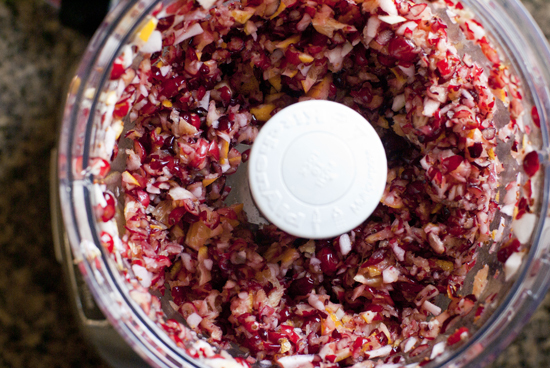 Somewhere along the way, my Grandma started making a homemade cranberry relish. And in full disclosure, she may have been making it all along, but my child-eyes were always so drawn to the cylinder of wonder that I was unlikely to notice anything else. It wasn’t until I was a bit older that I remember tasting my Grandma’s cranberry relish and my opinion on what cranberry could be, changed dramatically. When planning My Ultimate Thanksgiving Menu, this was a must have. 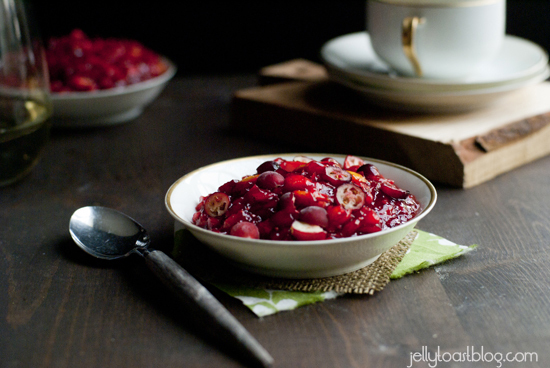 This relish is uncooked so it retains the tart flavor of the cranberries, but is sweetened with apples, oranges, cherry gelatin and a bit of some sugar. I love that it uses cherry gelatin. It’s a little nod toward canned cranberry. That coupled with the flecks of orange peel dancing throughout, well, it just makes it feel right. You will see in the recipe that it includes walnuts but I have them listed as optional. My Grandma always puts the walnuts in her relish, and it is ah.ma.zing. Due to the Baby’s nut allergy, I leave them out of mine for my day-after-Thanksgiving menu and honestly don’t miss them (too much). The Baby loves this so much that it would break my heart to make a batch that she couldn’t enjoy. If you don’t have any problems with nuts in your house, by all means, put in the walnuts! You won’t regret it. 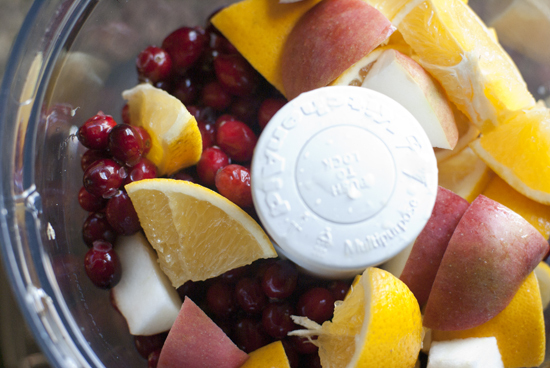 Your food processor will make quick work of chopping up the fruit. Until this year, I had been limping along with my little ‘mini prep’ food processor and had to make this in about 7 (felt like 70) batches of fruit. Last year for Christmas, my husband gave me a new Kitchenaid 13-Cup Food Processor the best present a girl could get! 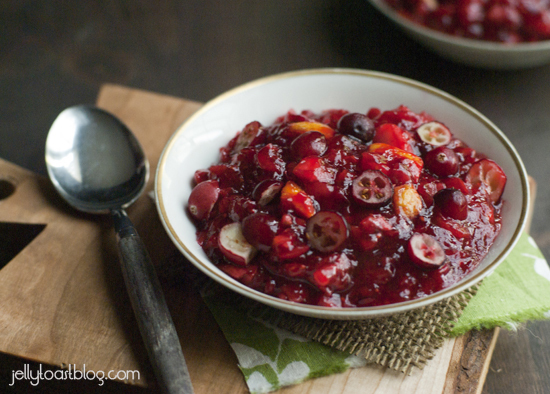 After making the cranberry relish this year, I was momentarily speechless when I made the entire recipe in one big batch. I stared for a moment. ‘What in the world? I must have missed something, I couldn’t possibly be done.’ Needless to say, I am in love with my new food processor. 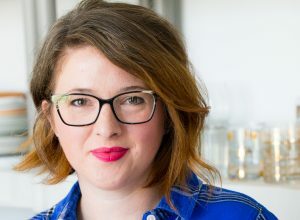 If you have a little ‘mini prep’ style food processor, give it a little pep talk and make this anyway. It’s worth the extra batches of processing. 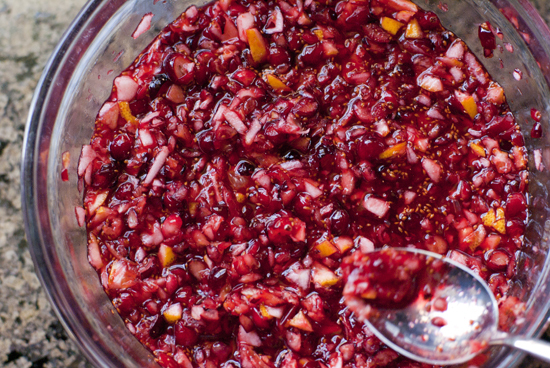 This makes a large amount of cranberry relish but the recipe can be easily halved. Or save the leftover relish to sneak bites of every time you pass the refrigerator to spread on after-Thanksgiving-day sandwiches. Yum. My last little tip-er-oo for this side dish is this: make it the day ahead of time. It really needs some chilling time to set up. Every year at my husband’s work, they host a Thanksgiving Potluck meal, and he signs us (me, really) up to make a batch of cranberry relish. I make it the night before and it’s perfect the next day. Unfortunately, there’s rarely any left to bring home. Stay tuned for My Ultimate Thanksgiving: Sausage Filling (aka stuffing). 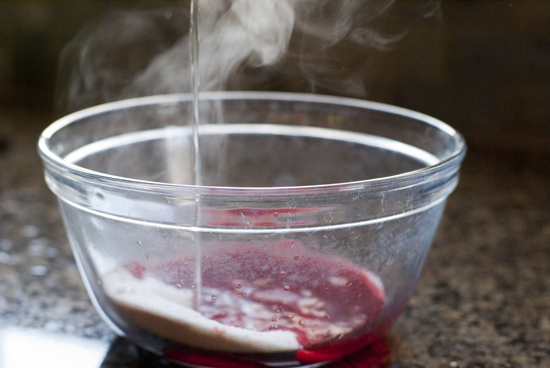 Stir fruit into gelatin mixture until combined. Fold in walnuts (optional). Refrigerate overnight. Serve cold alongside all of your Thanksgiving fixings.